I took a film appreciation class once at a community college. The instructor had us write about our favorite movie; three students listed the Arnold Schwarzenegger comedy Twins. My choice was agonizing – The Godfather was my cinematic gateway drug, but I’d recently watched Citizen Kane and was buzzing on its photography; also, I knew there were other masterpieces I hadn’t yet experienced. I’m older now and come across fewer gems than when everything was new; still, the pleasure can be more intense because of wisdom and experience gained. 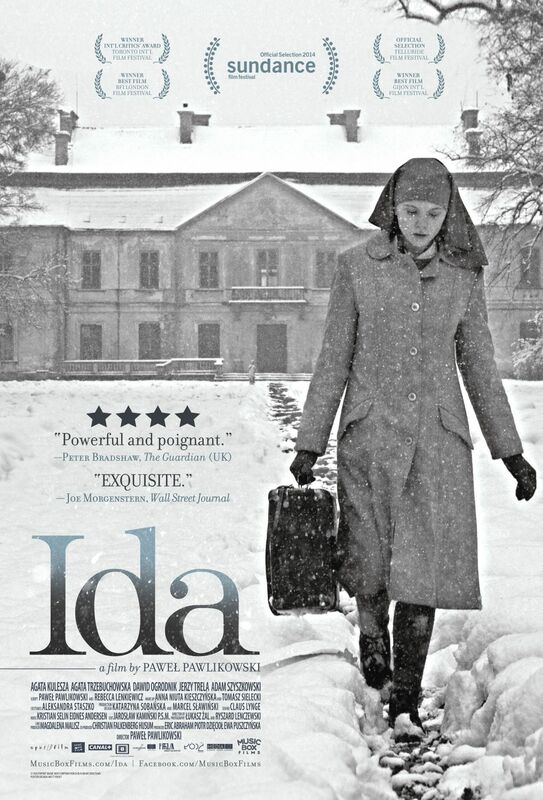 Pawel Pawlikowski’s Ida now joins my list, and might well have been my pick even 25 years ago in that class. I’m pretty sure my classmates wouldn’t have known what to make of it, but looking at this year’s hits I think they’re being well catered to. Ida is deceptively simple; Pawlikowski rarely moves the camera, preferring meticulously staged compositions that startle and build themes in their accumulation. The black and white cinematography by Lukasz Zal contains some of the most lustrous cinematic images I’ve ever seen – breathtaking in their clarity, and every shot tops the last. Characters are often placed in the bottom of the frame, suggesting God or the Government looming over all; sometimes harsh winter clouds can be seen moving across those backgrounds, and the effect is more immersive than any 3-D film I’ve seen. Pawlikowski’s formal approach seems classical at first; Ida feels like it might have been made fifty years ago. There is no score, which also lends to the austere impression until it is contrasted with the bustle of city life and the beautiful energy of a jazz band. The sound design is superb – like the photography, it builds the story and isn’t as simple as it first seems. Anna (Agata Trzebuchowska) is a orphaned novice in a Polish country convent. She is summoned by the Mother Superior and told she must visit her aunt Wanda (Agata Kulesza), whom she has never met, before she takes her vows. Anna dutifully makes the journey, and encounters a hard-drinking hedonist who mocks her – one of her first revelations is that Anna is actually named Ida, and she’s Jewish. “A Jewish nun,” Wanda sniffs. Anna wants to see where her parents are buried, so the two make a journey to their home village; we gradually learn that Wanda is a judge, and a communist party official. They pick up a hitchhiker, a musician on his way to play a gig. Finding Anna’s parents, Wanda’s beloved sister and brother-in-law, isn’t straightforward – they were Jews who were hunted by the invading Nazis during the second world war. That history hangs over the movie – the sense of a country that is only beginning to recover itself in the aftermath. Pawlikowski doesn’t underline anything – he lets the audience discover. At first, we see only what Anna sees, and Trzebuchowska portrays her minimally; her eyes are incomplete clues to what she is thinking. She reminded me of a young Claire Danes – self possessed and watchful. Kulesza’s Wanda is an intriguing contrast, all hard edges yet easily wounded. The differences between the women are mirrored in the film’s other contrasts – church/world, country/city, women/men. At first glance, Ida is Anna’s coming-of-age story – Wanda asks, “What if you…discover that there is no God?” It’s a brave question, particularly when the answer isn’t insisted upon. Yet the story is as much Wanda’s re-examining of her own life – there is a devastating revelation and a subsequent plot element that belong to Wanda, and then we see how those play out in Anna’s journey. As I watched, I jotted the following: “Thematic explosions of meaning.” Everything accumulates, and everything affects and is affected by everything else. I think ten people watching this movie will develop at least ten different impressions – it’s amazingly rich. Not least among Ida’s pleasures is that its protagonists are internally self-directed women, allowed to define themselves independently of men and society’s expectations. The “madonna/whore” complex concerns the idea that men see women as saintly or sexually debased, and can’t reconcile the two. Ida makes the concept literal, and then explodes it in the film’s quiet climax. I can’t think of a more radical ending than what Pawlikowski presents – Anna/Ida’s ultimate decision feels perfect for her, and subverts the judgment of God/society. Few would call it a happy ending, and the winter remains oppressive as ever; I loved it. One can tell you are passionate about Ida. And I will keep an eye out for it (within our various viewing vehicles). But it was your first paragraph that caught me. Actually, it was your very first sentence. As an upperclassman in college, I still needed to fulfill a Humanities elective. And I opted for a cinema class. To this day, I retain much of what was discussed. But because movies are not my primary passion, I do not view them with the same criticality as you. However, that class has enabled me to view flicks with a tad more criticality than most. An increased knowledge of a medium – in the right hands and in the right mind – can only serve to enhance that person’s maturity level as an artist. And that comes through in your writing about movies. Thanks Paul, for such a thoughtful response. I am in full agreement that more knowledge about the arts leads to greater appreciation and enjoyment.